Quite Noisy on the Norfolk Front | No Chic. Just Geek. We talk quite glibly about ‘the war movie’ as a distinct genre, and I suppose there is some truth to that – there are enough commonalities of subject matter, setting, and theme for these films to comprise a recognisable canon of sorts, after all. And yet war films are as diverse a bunch as any other, often depending on exactly which war they concern and the accepted narrative concerning it. War movies made during actual wars are usually propaganda, plain and simple; ones made in the decade or two after a war become testimonials, usually concerned with retellings of notable deeds. After enough time has elapsed they just become backdrops for rousing adventures and/or examinations of more universal themes. John Sturges’ film adaptation of the Jack Higgins novel The Eagle Has Landed came out in 1976, thirty years after the Second World War concluded, at a point when the myth of the war and its iconography was perhaps beginning to displace memories of the reality in terms of how it was perceived. Certainly the film itself is hardly painstaking in its attempts at historical accuracy. Things get underway in – one surmises – late 1943 or early 1944, with the result of the war no longer in doubt, only the final score. Inspired by the rescue of Mussolini from captivity in Italy, Hitler (played by the late Peter Miles in scenes which didn’t make it into the final cut) orders the kidnapping of Winston Churchill from Britain: no-one but Himmler (Donald Pleasence) takes this notion seriously, but the head of German military intelligence is obliged to carry out a feasibility study for political reasons anyway. The Eagle Has Landed is very much an all-star all-action mid-seventies ITC Entertainment kind of production, and it is perhaps illuminating to compare it to the 1943 movie Went the Day Well?, directed by Cavalcanti. Both deal with the same idea, of a British village being seized by enemy paratroopers as part of a wider plot, but the treatment is quite different, as is the context of the films (of course). Went the Day Well? is a propaganda movie, and an occasionally brutal one, with precious few shades of grey as the heroic villagers (including a gun-toting Thora Hird) rise up and do battle with the vicious German interlopers. At the time the threat of invasion was still a recent memory, and the war still being prosecuted, but in 1976 things were very different. We tend to remember the Second World War as one of the ‘good’ wars, justified by the fact it was essentially a heroic battle against the darkest of evils, but there’s little sense of that watching Sturges’ movie – this is a war movie oddly bereft of bad guys. All the German characters are rather sympathetic, Himmler excepted, and the movie is at pains to establish Steiner as a decent man revolted by the Nazi doctrine of racial superiority. 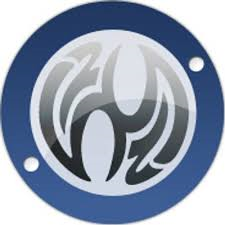 The structure of the movie means we get to know these people rather better than any of the British or American characters who are ostensibly the heroes who foil Radl and Steiner’s plan – the US Ranger commander played by Larry Hagman is a vain, pompous fool, his subordinate (Treat Williams) something of a cipher. The result is that the action sequences towards the end of the film, in which the German-held village is assaulted by American soldiers, feel like a curiously empty spectacle. They’re very well staged and directed, and do stir the blood a bit, but you always know what’s going to happen, and you don’t feel particularly invested in watching the inevitable Allied victory – you will almost certainly be hoping that Michael Caine survives, and may even be hoping that (in defiance of historical fact) he succeeds in his mission. The question is whether this moral vacuum at the heart of the movie is a deliberate choice, reflecting the fact that there can be heroes and villains on both sides in a war, or just the result of a director not quite getting to grips with the material. Certainly Caine thought it was the latter, complaining that Sturges had no involvement with the editing of the film once shooting was complete, choosing to go fishing instead. He lamented the fact that what could have been a more substantial thriller ended up as a somewhat cartoonish action adventure. I can see what he’s getting at, because – as someone else has pointed out – Pleasence’s impersonation of Himmler is the most credible thing in the movie by quite some distance. Caine is still good, as are many of the other supporting players, some of them better known as British TV faces – Jean Marsh is in there, also Roy Marsden and Denis Lill – but possibly a bit too prominent is Sutherland. Sutherland goes all-out for the central casting Oirishman from County Leprechaun approach, and it does make you roll your eyes a bit, as does the improbable romance between him and a young local girl (Jenny Agutter). 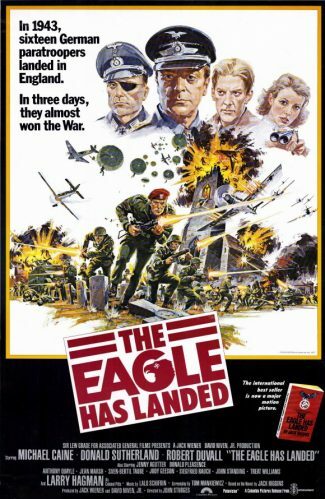 In the end The Eagle Has Landed seems to have become one of those largely innocuous all-star movies which regularly pops up on TV on Bank Holiday weekends, usually with its gorier moments (Hagman’s death, for instance) snipped out. Which is fair enough: it is an example of the war movie reduced to the status of simple entertainment – it doesn’t have the simplistic morality of the worst kind of war film, nor the complex ambiguities of many of the best. It just doesn’t seem inclined to deal with wider moral issues at all, focusing on its straightforward action-adventure story to the exclusion of all else. And there’s not much actually wrong with that, I suppose: but with the kind of talent involved in this movie, you could be forgiven for hoping for something slightly more substantial.